Andy Murray says top players are "serious" about their call for changes to the tennis calendar - and that some form of strike cannot be ruled out. Players are upset at overcrowding in the schedule and will meet in Shanghai next month to plot their next move. 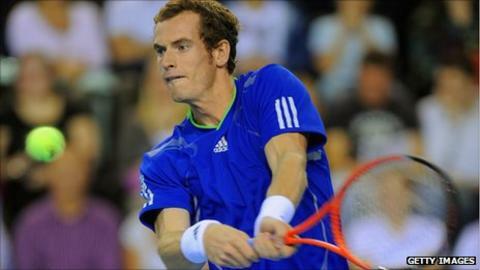 Murray told BBC Sport: "It's a possibility. I know from speaking to some players they're not afraid of doing that [striking]. "Let's hope it doesn't come to that but I'm sure the players will consider it." Asked whether the subject of a strike or boycott will be mentioned during the meeting in China, he continued: "Yes I think so. "If we come up with a list of things we want changed - and everyone is in agreement but they don't happen - then we need to have some say in what goes on in our sport. At the moment we don't. "We'll sit down, talk about it with the Association of Tennis Professionals (ATP) and International Tennis Federation (ITF), see if they will come to a compromise and, if not, we'll go from there. "We just want things to change, really small things. Two or three weeks during the year, a few less tournaments each year, which I don't think is unreasonable." The men's tour requires players to compete in a minimum of 12 events along with the four majors. The tour finishes at the end of November, a month after the women's equivalent. This is followed by the Davis Cup final in December. Last year ATP chief executive Adam Helfant, who has since decided to leave the governing body, announced the Paris Masters and the World Tour Finals would be played back-to-back, so two weeks have been saved in the 2012 ATP calendar. But Murray argued: "Right now it takes so long to change things. "To get another change implemented may take five or six years at the rate things are going and then all of us will be done [retired]. We want it to happen sooner rather than later." At the US Open, Rafael Nadal reached the final after playing three singles matches in three days. He then had one day off before playing for four hours against Novak Djokovic. As Roger Federer, Rafael Nadal, Novak Djokovic and Andy Murray push themselves to the final stages of pretty much every tournament they enter, with athleticism and sheer brutality rarely seen before, the strain on their bodies is increasing. Straight after that match he was on a plane to Spain and, four days later, playing a potential five-set match in the Davis Cup. But ITF president Francesco Ricci Bitti said last week that complaints by Nadal over the Davis cup scheduling were "inconsistent", saying players voted for the current dates, against the ITF's wishes, back in 2009. An ATP spokesperson highlighted recent tour changes such as increased prize money, byes for top eight players and best-of-three set finals. And a statement from the organisation added: "The players should and do have a major say in how the game is run. We remain committed to working with the players and other governing bodies to continue to address their issues."